It’s hard to talk about a country with as much appeal as Thailand. For some people it has the world’s most perfect beaches, those white sandy idylls fringed by jungle, and dramatically sharp karst islands in turquoise seas; for some it’s a cuisine explosion, with flavours borrowed from everywhere and married with the Thai staples of lemongrass, chillies and fresh seafood; for some it’s Bangkok and all it promises; while for others it’s the ancient, glittering temples and the magic of the modern Buddhist monasteries where people still live their lives to an ancient heartbeat. And some people just really love immersing themselves in the marketplaces and busy streets in amongst a country-full of people world renowned for their friendliness. The Hotel Guru’s list of recommendations for the best places to stay in Thailand includes somewhere perfect for enhancing your experience of any of these types of visits. This country has a huge amount to offer, and there are a huge number of hotels offering accommodation, so it’s good to start with a recommendation. Most people start their Thai odyssey in busy, bustling Bangkok, a city whose many smells and colours have the power to permeate almost everything - but seem to stop at a respectful distance from the shrines and temples, which are the other thing Bangkok is known for. So that you get this fantastic experience of a real sea of movement and life and then ancient stillness. A foodie destination like no other, and a shopping destination like no other, so much life in Bangkok is conducted on the streets and just beside them that it’s a fantastically rewarding city to lose yourself in. There are a few people who skip the city and head straight for the beach, with the Andaman Coast and its islands being the most common destination. Krabi Province makes many a traveller’s eyes water with longing. This is the region for what it’s known for: knifelike shards of limestone karst jutting out of pristine turquoise waters home to bright fish and corals. The beaches are almost impossibly white, with fine, soft sand, and the local communities colourful, friendly and heavily reliant on visitors. There are 150 or so islands off the 120kms of shore - many of them uninhabited, but it’s a lot of territory to explore and enjoy, and you’ll probably want to do quite a bit of this. So sort yourself out some boat tours or a private hire. Phuket Island is one of those daydreamy islands, with perfect white, sandy beaches which stretch on until you reach sharp limestone cliffs, with lush tropical jungle on one side and the famously bright turquoise waters of the Andaman Sea on the other side. Relax, dive, snorkel, explore the jungle, island hop, drink well, eat well and be well looked after. That’s the Andaman Sea for you. Chiang Mai is the other Thai destination most visitors consider unmissable. This is Thailand’s northern capital and it’s very different to Bangkok. People come here for the temple complexes, and one of the things which has kept Chiang Mai so special is its peaceful, remote location. Until the 1920s the only way you could get here was by trekking on the back of an elephant or up the river. Once you reach the walled city you come upon around thirty painstakingly decorated temples, dating from the founding of the kingdom. The old city is only about a mile square so it’s easy to get between them, and in between the temples are the houses and hotels which make this a very residential historic centre. Then there’s Thailand’s rural heartland, with its rice paddies, villages and tropical forests - often bumping up against the silvery mountains or limestone cliffs of the coast, depending on how far south you travel. And the country’s sacred spaces, like the underground cave shrines at Kanchanaburi and Phetchaburi, or hilltop temples, or even one of the many wonderful festivals you can encounter just travelling through. It’s been well travelled, but there’s still a lot of magic to Thailand. Bangkok is a great entry point for Thailand because it offers a great opportunity to meet the Thai people and try out your communication skills. Don’t shy back from the markets or from street food, you’ll really be missing out on one of this city’s great experiences, and you’ll soon learn that it’s big smiles and and air of friendliness that prevails over the spoken word. When it comes to the other side of Bangkok’s appeal: its temples and shrines, the highlight for many people is What Phra Kaew, an incredible temple complex of golden spires and graceful, colourful roofs, which houses Thailand’s most sacred treasure, the Emerald Buddha, and is also part of the Grand Palace, the former royal residence. The grounds are huge, and there are more than one hundred buildings, built by two hundred years worth of royal inhabitants. Even though this is a large complex it can feel quite busy, so if you feel a little overwhelmed by all the gilding and photographers, take a break in the mural area which is often the most peaceful. The temple of Wat Arun is part of the same complex, and it’s one of the few Buddhist temples you’re encouraged to climb on. Bangkok’s Wat Pho is where you’ll see the famous reclining Buddha - and it’s just as massive as you’ve been told it will be. It also houses a huge collection of images of the Buddha. And a famous Thai massage school with two massage pavilions. Wat Traimit is where you can see the fantastic solid gold Buddha. He’s 3 metres tall and weighs about five and a half tonnes. This temple is in Chinatown, a fascinating area to walk around anyway. Phuket and the Andaman Sea are daydream destinations promising perfect white, sandy beaches which stretch on until you reach sharp limestone cliffs, and to one side of you is lush tropical jungle and to the other side bright turquoise water stabbed with impressive karst shards topped with unlikely tousles of green. Don't miss out on all the watersports on offer. You can go sailing or jet-skiing, try parasailing, or diving, snorkelling or free diving, kite-surfing, canoeing or deep sea fishing. If you didn’t travel to the Andaman Sea specifically to dive, it might still be an idea to give it a try - there are few more rewarding spots on the globe. Hin Daeng certainly up there as a great local sight, it’s a feeding place for large pelagics and you’re guaranteed to see a lot of marine life. Hin Muang is the other local highlight. If you’re a serous diver, or a serious beach-lover, you might also want to visit Khao Lak, a series of tourist-orientated coastal villages along Thailand’s picturesque South West coastline, and the gateway to the Similan Islands. This is also a great beach resort for families. For natural treasures above the ground visit Krabi’s Mu Ko Lanta National Park. Or Phanom Bencha National Park, which has some wonderful pools and waterfalls for inland swimming, including the Emerald Pool, which is worth seeking out. Walk and relax amongst these pristine and protected scenes. Phi-Phi viewpoint for one of the most spectacular views Krabi Province has to offer. Ko Phi Phi is where “The Beach” was filmed, so you might want to see it for yourself. If you don’t have quite enough time for a proper trip around the islands you might want to consider a visit to Hua Hin, a fishing village which was turned seaside resort when the royal family built their summer palace here. it’s only three hours out of Bangkok. Outside the walls of the old city are another 250 or so temples, most of them within the modern ring, but the Wat Phrathat Doi Suthep, with its gold-plated chedi, is about 18kms from town. While you’re out here you might want to visit the lush Royal Palace Gardens which are about 4kms down the road.an amazing Lion Buddha and an enormous sanctuary decorated with a mosaic of tiles. If you enjoy Chiang Mai you might also want to visit Ayutthaya, sometimes known as the “Venice of the East”. The former provincial capital was largely destroyed in 1767 by the Burmese army, and is now a UNESCO World Heritage Site including ancient temples and Wat Chaiwatthanaram, generally considered to be one of the most imposing ancient Buddhist monasteries. Use our guide to the best places to stay in Thailand and start to plan your trip to this wonderful country, which is so full of contrasts. We have a property to suit all tastes and budgets, from cheap family friendly options, to no-holds-barred luxury retreats. For the best the city has to offer stay at boutique treat The Siam. Expect palatial surroundings and impeccable service, and when it’s time to go out and explore the city you can do so via the hotel’s tropical gardens, which lead down to the river and your own private speed boat. It’s a nice touch. 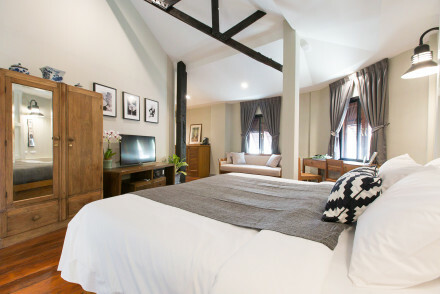 Packed with antiques and colonial-inspired design, the Cabochon Hotel has just eight rooms, so is understandably intimate, and the service feels very personal. You’ll discover nooks and crannies perfect for a private drink, and a sun library/bar packed with books, magazines and comics. There’s a long, lean rooftop pool which feels peaceful despite the frenetic views (the property is nestled amongst the skyscrapers). The Maduzi takes a zen-like approach to their take on luxury, which really works well in this busy, central Bangkok location. There are just 41 rooms, some with jacuzzis and complimentary mini-bars, there’s a great terrace bar, a 24hour gym and a gourmet French-Japanese fusion restaurant. So Sofitel is chic, modern and minimalist, with lots of glass and decor designed to frame the fantastic views over Lumpini Park and the rest of the city. There’s a rooftop infinity pool and a range of dining and drinking options, plus you’re moments from the green of Lumpini Park. For something more unabashedly luxurious consider 137 Pillars House, Bangkok, which has a mere 34 vast and sumptuous suites. It also offers private butler service, and has a fantastic rooftop infinity pool - which is really useful for your children. 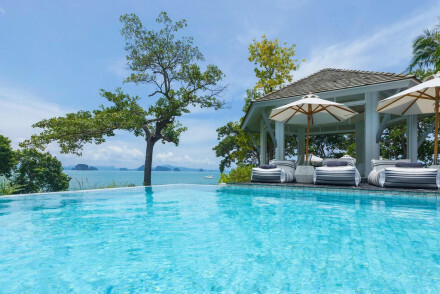 The Banyan Tree Ko Samui is a collection of stand-alone villas, separated by pockets of jungle, but all with sea views and access to a private beach. This is the kind of resort where nothing is too much fuss, and the added extras are impressive: we’re talking access to a complimentary private catamaran or a deep sea fishing trip. The Four Seasons Ko Samui is an almost impossibly romantic collection of villas - complete with plunge pools, breathtaking views and a luxuriant amount of space. There are 70 rooms and villas in all, with impressive facilities to go with them: a private beach with a beachside infinity pool, a wellness spa and a choice of places to eat and drink. 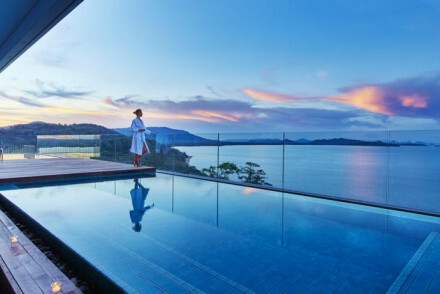 The Como Point Yamu is a great value option if you want to treat yourself to a proper Phuket experience. With an enviable position overlooking the Andaman Sea, two excellent restaurants, an award-winning spa, rooftop infinity pool and daily menu of sporting and cultural activities, this is classic Phuket. If you’re looking for peace and elegance in Chiang Mai, Rachamankha might be a good choice for you. It has just 24 rooms, arranged around a series of shady courtyards, plenty of art and a wonderful fusion restaurant. 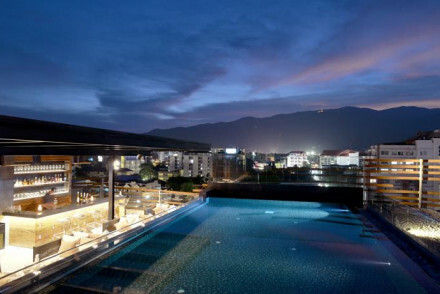 The North Hill City Resort is a smart property set within lush grounds just to the south of Chiang Mai town. The contemporary decor is sophisticated and functional and there’s a great spa and restaurant. A comfortable place to stay if you’re not quite ready to be within the visitor-bustle of town. 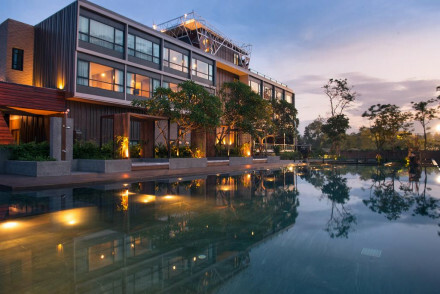 137 Pillars House is a 30 room boutique hotel right on the river, yet feeling a world away from Chiang Mai’s busy streets. The facilities are first class and there’s an atmosphere of old world charm. The suites, wth their big baths and huge beds are fantastic, but families will probably be more interested in their interconnecting rooms. On the banks of the Chao Phraya river in Ayutthaya is Sala Ayutthaya, a modern, boutique hotel with white on white decor and plenty of glass. There area 26 rooms with boutique features like freestanding baths and chic detailing, as well as an art gallery and a courtyard pool. Ko Samui’s Vana Belle Resort sits just back from a stunning stretch of pristine beach, and its 80 rooms and suites offer views and peace. But, if you want it to be, this resort can be more than just a place to relax, it encourages guests to learn more about the local culture, and, as well as offering fitness classes, the resort also offer cultural activities. Krabi’s Rayavadee is surrounded by nature’s most beautiful sights - lush foliage opening out onto a white, sandy beach or limestone cliffs. And this five-star hotel doesn’t disappoint when it gets to the indoors either. There are private villas or rooms and suites in the main hotel - most with large bath tubs and some with private pools. There’s plenty to entertain your kids if you have them, and an air of romance if you don’t - helped by the choice of four restaurants. The hotel’s boats will take you on outings and you can walk the local trails and not need to leave the immediate vicinity. The Nai Harn is a Phuket stalwart which has just undergone a renovation. Now the 130 room property has a Mediterranean feel with stylish rooms and open views. There are great family rooms and you’re just two minutes from the beach. Kata Rocks is also well known on Phuket and has fantastic sea views from its luxurious rooms and villas, and chic, contemporary decor. Small and secluded there’s a Mediterranean restaurant on site and access to a chaser yacht. 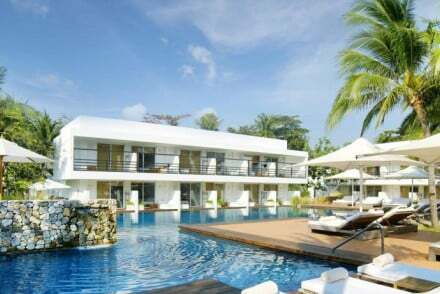 Putahracsa, on Hua Hin Beach, is an oasis of airy rooms, private pools and chic suites just three hours out of Bangkok. The restaurant is lively at night and there’s an oceanside beach club. The Casa de la Flora, right on Ban Niang Beach in Khao Lak, is a five star property with 36 individual villas with sea views, their own plunge pools and butler service. The restaurant is excellent and there’s a spa and cocktail bar. This is the perfect place to relax. Phuket’s Amanpuri, a typically luxurious Aman spa resort, offers a haven of tranquility with private villas, private pools and a choice of five restaurants. This is a relaxingly low-tech resort with plenty of activities and spa treatments on offer if you need help filling your time. Just around the island is the Paresa Resort, a secluded, jungle resort offering pared back luxury: villas with stunning views through floor to ceiling glass walls, and decorated with natural wood for example. Some also have a private pool, and all have spa baths. If you want romance on Phuket consider Keemala’s ‘birds nest villas’ accommodation, arranged within the treetops. Each ‘nest’ has a canopied bed, a huge egg-like bathtub and a private pool. There are just 38 ‘nests’ and two restaurants serving food which is largely grown on site. 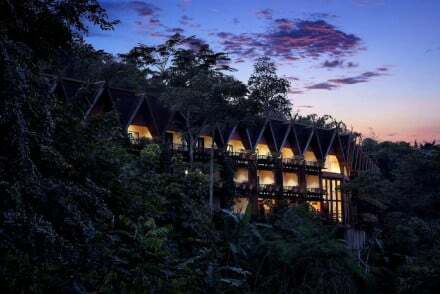 Chiang Mai’s Dhara Dhevi Chiang Mai is a magical, 60 acre sanctuary, complete with pools and spa and a timetable of activities which encourages you to experience this region’s cultural and architectural heritage as well as the resort’s charms. 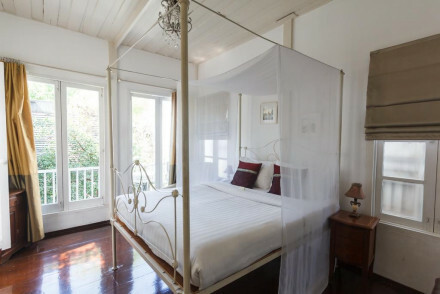 The 123 rooms and suites are decorated with a blend of colonial and Thai styles and there are some seriously luxurious features if you’re looking for a real treat. Chiva-Som is a super-lux, super-healthy wellness retreat in Hua Hin. In addition to the seriously impressive array of world-class treatments aimed at refreshing and revitalising your mind, body and soul, there’s also beautiful surrounds and sympathetic architecture. 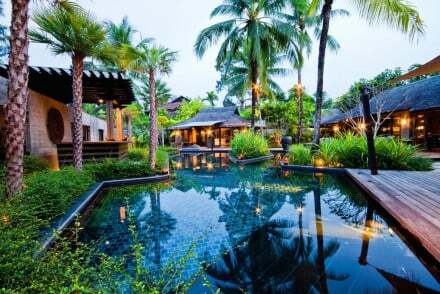 Khao Lak’s The Sarojin is a gorgeous resort, carefully, and beautifully, incorporated into the surrounding jungle. Their pool has won awards and is considered one of Asia’s Top Fifty - which is quite a feat - and their spa is suitably indulgent. They also have a private yacht, and an excellent fine dining restaurant. The Amari Watergate Bangkok is a giant of a five star hotel, with 570 rooms, a huge fitness centre, a luxurious spa and numerous dining and drinking options. And it’s in a great spot - especially if you’re looking for great value accommodation to increase your shopping spend. Rooms here start from less than £80 per night. For just over £100 per night you could also stay in the Como Metropolitan Bangkok, which has 169 generously proportioned and luxuriously minimalist rooms with state of the art bathrooms. The Thai restaurant is well known and well loved and there’s an inviting outdoor pool. The majority of visitors arriving in Thailand land in Bangkok, which has two international airports. Suvarnabhumi Airport, which is the main airport and one of the busiest in Southeast Asia, is about 30kms to the east of the city and is linked by an Airport Rail Link - or taxis at an internationally competitive rate. And Don Muang Airport, which is 30kms north of the centre of town and was usurped as Bangkok’s main airport in 2006. The cheapest way to get into the city from Don Muang is by train, which takes about an hour, but you can also catch a cab. If you’re transferring straight on to another Thai destination make sure your connecting flight leaves from the same airport. Thailand is long and thin, rising upwards from the equator, so weather conditions are far from uniform through the country. But generally speaking the best time to visit is during the cool, dry season, which, for most of the country is between November and the beginning of April. If you’re here to dive then the best conditions are probably between November and January. Still not sure which is the best place to stay in Thailand for you? or Krabi? Or on Ko Samui? Set in a quirky refurbished art-deco-inspired cinema, with the original cinema screen and equipment still in place in the lobby and bar area. Design has a classic heritage feel with quirky contemporary touches. Find something to suit all budgets with both dorms and spacious suites available. A hidden gem in the Boho Thonburi side of Bangkok. Tucked in off the street, is this haven of calm- think polished concrete floors, wooden bathtubs, fourposter beds and proper espresso coffee. You overlook the Chao Phraya river and are just minutes from the main sites in a water taxi. This island resort fuses traditional Thai style with splashes of Mediterranean colour that reflects its enviable position overlooking the Andaman Sea. An award-winning spa, daily menu of sporting and cultural activities, and two outstanding on-site restaurants make it even harder to leave. Sights nearby - Khao Phra Thaeo National Park within five miles. Swimming Pool - Pool with view, rooftop pool, infinity pool. The Slate is a stunning 5* hotel located just a stone's throw away from Phuket's coast. This peaceful oasis boasts gorgeous suites furnished in a chic manner and with plenty of wooden influences. Their truly unique Coqoon spa is a must visit! Utterly divine cuisine. A luxurious and magnificent stay! Foodies - The property boasts eight exquisite eateries, all of which are definitely worth a visit! Total relaxation - Forget about all your worries as you unwind in their rainforest spa! A sophisticated quiet retreat on the outskirts of Chiang Mai. Perfect for a couple or family looking to counter-balance their holiday with golf, archery, cooking classes and a trip to the spa! Contemporary rooms are as sophisticated as they are functional. Golf - Play a round on the 18-hole course with spectacular views of panoramic view of Doi Suthep. Local exploring - A luxury base to explore the temples and countryside of Chiang Mai and its surrounds. Cooking classes - Take a 'farm to table' cooking class. Deserving of its five-star rating for the bathtub feature alone, akyra Manor Chiang Mai brings edge to Chiang Mai’s hotel scene. Stylish suites decorated in moody tones feature all the mod cons. Plus there is a rooftop bar and pool with city views. Gourmet Italian dishes can be enjoyed at Italics. A tranquil and relaxed boutique resort set on a private beach with bungalows tumbling down the lush hill gardens. Rooms have a traditional feel with teak wood, local fabrics and rich hues. They also have lovely beach views from the expansive windows. A delightful spot for a romantic break. 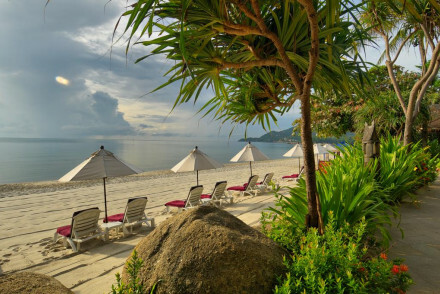 A warm and welcoming resort on the quieter end of Chaweng Beach. The private villas are charming and come with open air bathrooms and private terraces. Enjoy meals on the shore and drinks in the dappled shade by the pool. An intimate and familiar place that keeps drawing you back for more! This weekend oasis, three hours from Bangkok, soothes the soul. The airy rooms, lush grounds and beachfront location aptly showcase Thailand’s tropical beauty while the Oceanside beach club and restaurant keep things lively at night. Spacious suites with private pools are a welcome luxury. 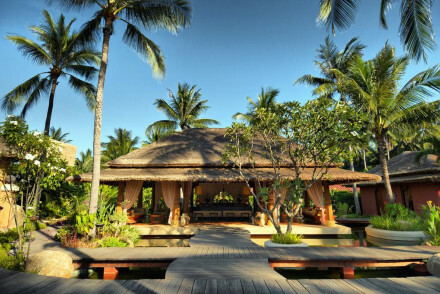 A tranquil resort modelled on a traditional Thai village surrounded by lush tropical gardens. Luxurious rooms are impressively spacious with high ceilings, antique furniture and lovely views. Boasting a private beach, two pools and no less than seven eateries. An ideal haven to simply unwind. A luxury resort situated in a stunning rural part of Northern Thailand and bordering an enchanting elephant resort. 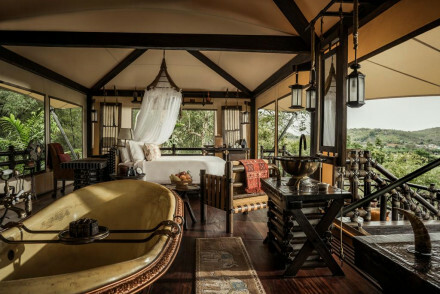 Chic rooms feature spectacular views, dark teak floors and raw silks. A fabulous spa will aid complete relaxation and find endless outdoor pursuits on offer. Bliss. Other Activities - Spend time with the elephants from the next door resort. Hideaway - A tranquil escape complete with superb spa. Cooking classes - Learn how to cook Thai food at the hotel's classes. Sailing - Take a long tail boat along the Mekong River. A luxurious camp hidden amongst lush vegetation in rural northern Thailand. Secluded tents offer utter tranquility and privacy. Boasting large terraces for spectacular views, luxury bathrooms and antique furniture. Spend days riding elephants or floating down the Mekong River. Glorious. Back to Nature - Hang with elephants, far from the maddening crowds, deep in the thick forest of rural Thailand. Local markets - Scour for regional handicrafts at local village markets. Sailing - Enjoy a scenic cruise down the picturesque Mekong River. A luxurious and beach-chic hotel overlooking the stunning waters of Phang Nga Bay. The rooms range from luxurious suites with private balconies to extravagant villas with private pools. The infinity pool and bar are the perfect spot to lounge and the leafy Hornbill Restaurant is fantastic. Bliss! 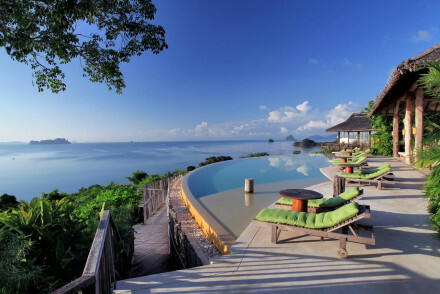 Set on an island in Phang Nga Bay, this resort offers the utmost in comfort and style. Hilltop villas are secluded and luxurious, open to their lush surrounds they also boast small terrace pools. An indulgent spa is utterly pampering and there's a private beach to lounge on too. An ideal weekend retreat from Bangkok, these five chic cabins serve up a dollop of European-inspired style just kilometres from Thailand’s largest national park. 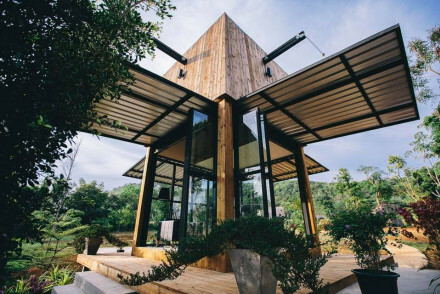 Back to Nature - Located in the heart of the Khao Yai National Park you are ensconced by nature. Local markets - An idiosynchratic visit Palio is modelled after a Tuscan village. 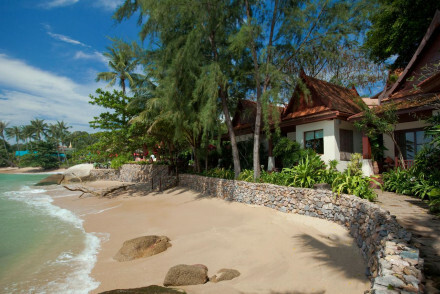 A serene spot on its own private stretch of Bo Phut Beach. The villas and rooms are beautifully laid out and offer open air bathrooms and private balconies and terraces. The restaurant is phenomenal and the staff are hospitable and conscientious. A real beach-side haven.